The Geographer ("De Geograff"), by Johannes Vermeer, painted 1668-69. Click on the painting to learn more about Vermeer and the 17th century Netherlands. This site covers cultural, historical, and political Geography. Physical Geography sites concerned with earthforms, mountains, oceans, etc., are most likely to be in Science & Nature > Earth Science, not here. 50 States Basic facts on all 50 states of the USA. 50 States in 10 Minutes Can you type in the correctly spelled names of all 50 US states in 10 minutes? Type them in any order, can even be all lowercase, but must be correctly spelled. "Helpful" countdown timer tells you how much time is left, adds stress. 360° Panorama of London "The 320 gigapixel image - taken by expert photography firm 360Cities – comprises 48,640 individual frames which have been collated into a single panorama by a supercomputer." Taken from atop a very tall skyscraper, you see everything for many kilometres (or miles) in all directions! There are about eight million people in London, and you probably see most of them. A Year of Reading the World- The list This is the list of 196 books, one from every country in the world, that Londoner Ann Morgan read in 365 days. An article from the BBC, " Reading the world in 196 books " tells the story of her quest to even find a book from every country. An article from The Atlantic discusses her favorites among the 196 books. Amy Poehler's Smart Girls on FB endorsed this. We endorse it because we feel learning about the people in the other 195 countries is essential to a young person's education. 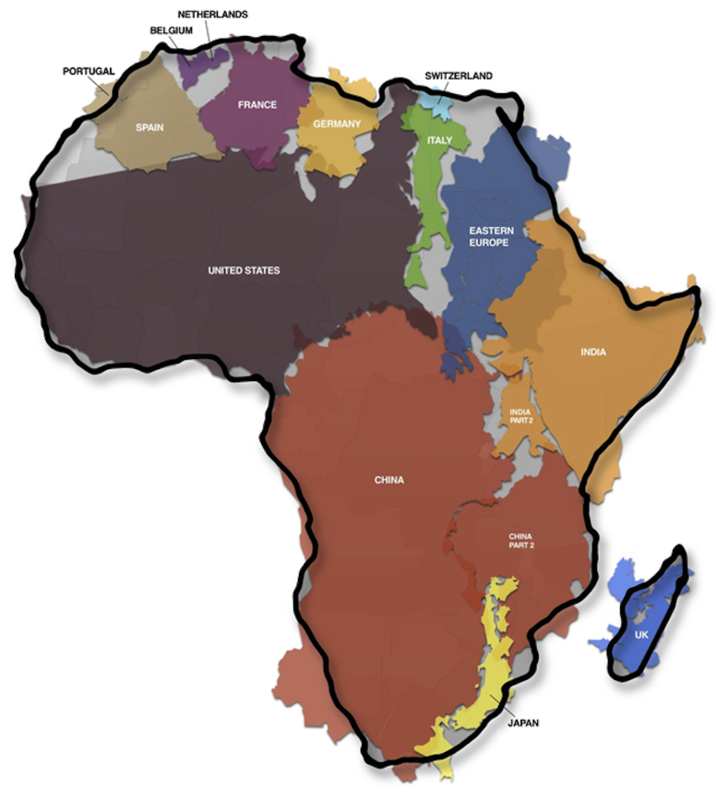 Africa is much larger than it is shown on most maps! Honest! Atlapedia Like an online almanac, with country info and stats, political and regional maps, and downloadable maps. A brief history of time zones is a brief history of time zones via interactive globe. This BBC site shows every time zone all around the world. GMT is explained, International Date Line, times zones in different countries, daylight saving time, and more. Kids can slide the horizontal scrollbar to move to other time zones and read more articles. 'Black Marble' satellite images of Earth unveiled - in pictures "Scientists have unveiled a new image of Earth at night. A global composite image, dubbed Black Marble, was constructed using cloud-free night images from a new Nasa and National Oceanic and Atmospheric Administration satellite. It shows the glow of natural and human-built phenomena across the planet in greater detail than ever before." Ten images show pretty much all of Earth at night. Geography classes could work on identifying continents, countries, cities and towns, lakes, oceans, highways, oil fields, fishing fleets, etc. Credit: This slideshow is posted in the Science section of theguardian. Map of Canada by littlepaperforest on deviantart. Charming, whimsical, and BIG (1600x1200) map. All the provinces and capitals are shown, also what each province is known for. This is all over Pinterest, too, but the original's on deviantart. CIA World Factbook Excellent information source for any country in the world. Well laid out site. It's now a secure site. Well, it is the CIA. Continents: A Student's Resource This great Australian page was suggested to us by a lady in Utah! Isn't the Internet great? Lists all continents, links to facts about all of them, list of all past supercontinents and their times, continental drift & tectonics, populations, other facts. also has history of continents, supercontinents of the future, much more. Links to a ton of information, all on one page! Thanks Liz Curtis, who suggested this link & said nice things about our Social Studies section! Chinese Zodiac Why is 2016 the Year of the Metal/Red Monkey? How many animals are there, how many colors and elements? What is there a 60 year cycle and a 12 year cycle? Find out all about it this series of sites. Each animal in the zodiac gets its own long page of facts overload! At the bottom of each page is a list of all the animals in the zodiac. Each has its Chinese character and how to say it in Chinese. Quite a resource! Earth's Seasons from Enchanted Learning. Find out about the Equinox, the Solstice, and the seasons of the year at this fine offering. Famous Canadians "The infographic is a virtual Canadian Hall of Fame. It showcases influential Canadians who have contributed to scientific and social development, economic security and prosperity, and the creative arts. 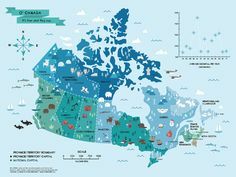 The infographic was designed to show visitors that Canada is home to great people who were visionaries and history-makers." This very informative page is from CanadaFaq, a site devoted to "Everything You Need to Know About Canada"; geography, history, people, finance, education, economy, immigrating, jobs, etc. Kudos to Vera Johnes at CanadaFaq, for the email telling us about this fine web site. 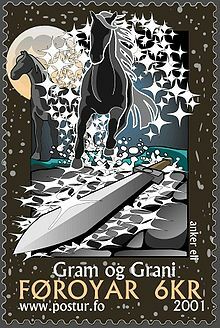 A stamp from the Faroe Islands, featuring Gram and Grani. Gram is Sigurd’s magic sword which is infinitely sharp. son of Odin’s horse Slepnir of the 8 Legs. Cool. and Swedish; descended like them from Old Norse. Flags of the World is the world's oldest and largest site about flags. "Here you can read more than 49,000 pages about flags and view more than 91,000 images of flags of countries, organizations, states, territories, districts and cities, both past and present." There are several ways to look up flags, too. Flu Trends from Google. Use this interactive Google world map to see, country by country, where the flu is bad, where it's absent, and anything in between. Not just countries, either: for many countries you can check by state or province! 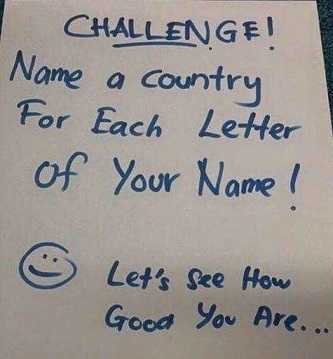 If you want to check on Alberta, Aragon, Arequipa, Buenos Aires Province, Franche-Compte, Hessen, Illinois, Kwazulu-Natal, Minas Gerais, or Western Australia, and lots more. This was a Kim Komando Cool Site of the Day. GIS Resources "Resource for GIS Welcome to the World of Global Information Systems" Lots of valuable links to maps sites, GIS lesson plans & education sites, geography links, and much more! Along with its sister GPS site, this is part of an Illinois-based ed initiative. GPS Resources "Welcome to the World of Global Positioning Systems. The following links will hopefully give the participants a resource to obtain information about GPS, sources to companies related to GPS, projects that are using GPS, and educational sites that have a wealth of information." A wealth of information about, and links to, GPS lesson plans and activities, Geocaching activities, the Travel Bug project, more. Along with its sister GIS site, this is part of an Illinois-based ed initiative. Geography Maps : Atlas of Europe and World Atlas Two separate sections highlight all the countries, rivers, and mountain ranges of Europe and of the entire world. 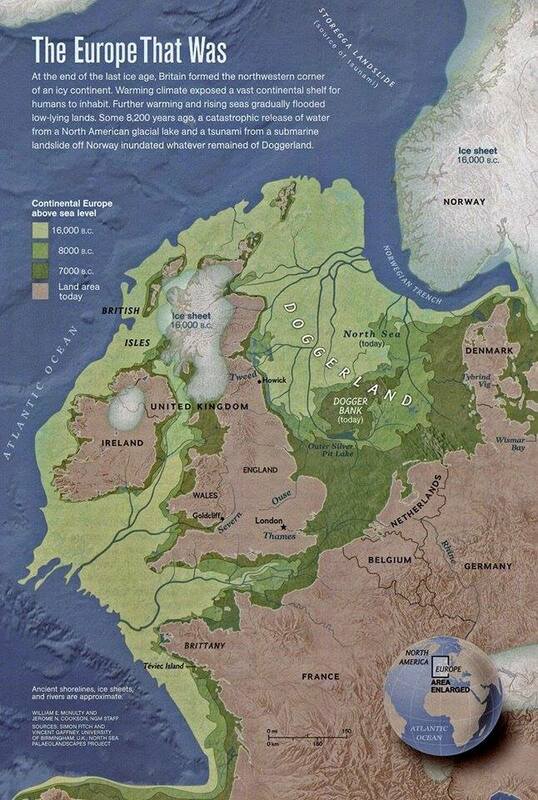 Great geography resource. Geonet from Houghton-Mifflin. Upper level (US high school) geography drills. Students will have to dig for answers and will have to read and think. Geography Dictionary & Glossary - The ABC of Geography "Welcome to possibly the most comprehensive geographic related dictionary on the internet for students... Over 1400 terms defined. This dictionary is primarily aimed at supporting secondary/senior/high school and early tertiary students who are studying Geography or related subjects such as Earth Sciences." Everything A to Z, from Abiotic to Zonal Soil. This excellent site from Hong Kong will become your fast reference for geographical terms. We want to thank Danny Harrington (BA Hons. Oxon), for this great addition to these pages. Geography from Space from the Smithsonian. "The Geography from Space contest is held every year during National Geography Awareness Week (in November). Contestants are challenged to identify geographic locations on the Earth based on a satellite or aerial image and a brief clue." The quizzes on this page are from the previous 10 years, at this point (9/2013). They are great, challenging geography questions. Geography Quiz Online point and click interactive quizzes on US states, Canada, China, Europe, Australia, Asia, Africa, Middle East, Central and South America, Caribbean, Oceania, and Continents and Oceans. 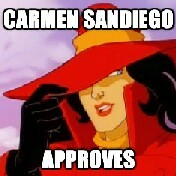 (Try saying that fast.) We used these with teenagers, and the quizzes are very good. Geography Quiz from Learning Planet. 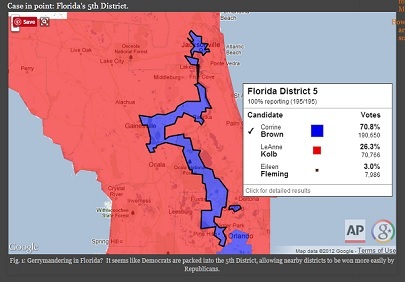 Fast interactive USA political geography for 4th grade and up. Geography Quizzes from JetPunk. Big list of good online quizzes. Geoguessr "Embark on a journey that takes you all over the world. From the most desolate roads in Australia to the busy, bustling streets of New York City." May be too hard for middle schoolers unless they do it in groups. Teachers could walk younger students through the game by asking questions of the class and giving hints. It's a game to see if you can figure where you are, using Google Street View. All you know at the start is that you are somewhere on Earth. 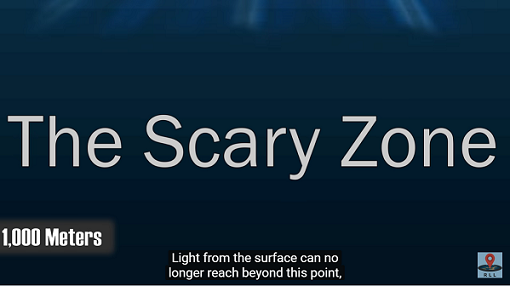 If that's too much area for you, there are maps of cities (New York City, London, Paris, etc.) and of countries (Canada, Australia, UK, Netherlands, etc.) and the European Union! Be a detective and a geographer. It's fun to use clues such as traffic signs, language, architecture, climate, trees, crops, and anything else you can find. ("Hmm. Olive trees and palm trees. That sign looks like it's in Spanish.") You could look up names of towns. ("I wonder what country Poznan is in?") Talk about honing skills! Try it out! 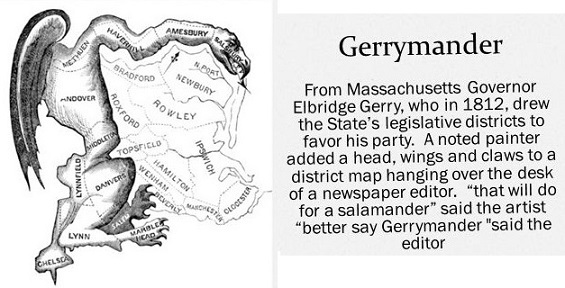 Meet the Math Professor Who’s Fighting Gerrymandering With Geometry This link's from A Mighty Girl's Facebook site. The original article from The Chronicle of Higher Education explains it in a more academic. Basically, Professor Moon Duchin of Tufts University, "has helped create a program to train mathematicians to serve as expert witnesses in court cases over redrawn electoral districts." 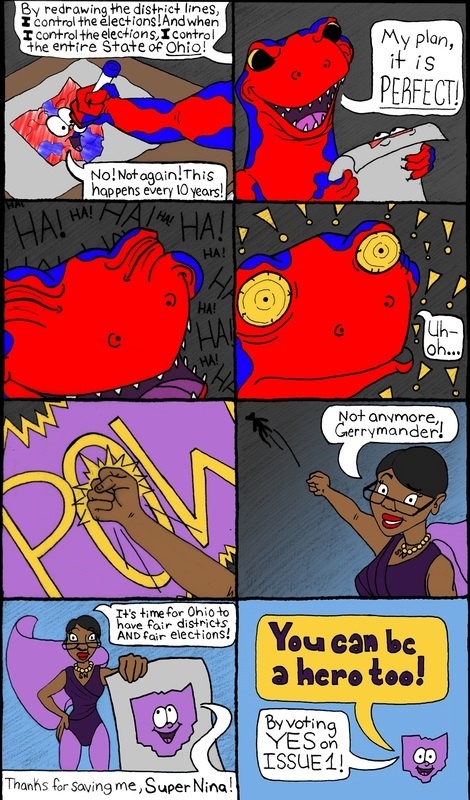 Since courts all the way up to the US Supreme Court have problems understanding gerrymandering, this is a good plan to overcome this evil practice. Read one or both articles, and learn. Gall-Peters vs Mercator Two different projections of the world map. 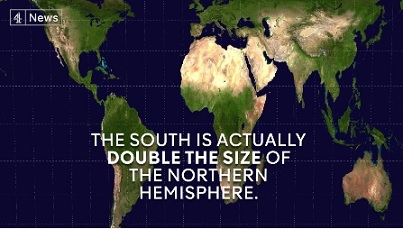 One is much more accurate comparing sizes of islands and continents; the other is traditional, comfortable, and exaggerates the size of the northern (or "white") countries. Watch the video, then research this for your own edification. Kids Web Japan is a great site about Japan for kids. Everything kids would want to know is here, including anime and manga. Also history, culture, folk tales, interactive things to make and do, etc. Lat-Long.com "Search More Than 2 million U.S. Locations in an Instant! Search More than 2 Million Places: Parks, cemeteries, bridges and post offices. Find these and more on Lat-Long.com." This site is a list of all 50 US states. You can click on a state and check out its features by category (did you know South Dakota has 91 canals?) or you can search by item and a state pulldown menu from the main page (example: glaciers in Alaska.) Google Maps display each item. Latitudes and longitudes are given in tradish degrees, minutes, and seconds; also in decimal degrees. Maps4Kids "Data is available on every State in the US, as well as for every Country in the world ! Maps4Kids.com is a great resource for fast facts about places in our world. The Top 10 page shows you the highest, longest, most populous." Medieval Map "This website illustrates the historical changes that occurred in the Medieval Era (400 - 1500) with an interactive map." Understatement! Move back and forth through time in 10 to 50 year intervals. Click on one button to show cities, another to show decisive battles. Click the ? button to see a modern map. For battles, there is a brief synopsis in a popup window, with the option to go to Wikipedia. Clicking on a city icon sends you directly to Wikipedia. The map shows all the contemporary peoples and states for the period you choose. Clicking on any label (example: "Balts") brings up a three-section pie graph. One section - the "W", sends you to Wikipedia. Clicking the folder" icon opens up a book or article, if there is one (in this case an e-book called "The Balts", by Marija Gimbutas). Clicking on the "film" icon will open a video, if there is one. The site is constantly being improved. It's quite a trip through time for middle school and older. Visual learners may finally grasp the idea of huge groups of peoples moving across Europe. See empires and kingdoms rise and disappear. Wonder at names like the Umayyads, the White Sheep Turks, the Principality of Polotsk, Navarre, Swabia, Trebizond, and all the rest. Mount Everest Gigapan These are some amazing jaw dropping zoom WAY in wide angle pan of Mount Everest and the area around it. The views are absolutely astounding. You can zoom in on people! It's mountain and glacier time! Anyway, just go there and zoom around. Multicultural Education through Miniatures from the College of Education, University of South Florida. "Multicultural Education through Miniatures includes photos, maps, stories, and games of handmade dolls and puppets from all over the world. This website can increase global awareness for children and adults. Explore by clicking Select a Photo, See Entire List, or Click a Map. Cultural games are also available at Go to Activity. Students and teachers can use the pictures, stories, and games for educational purposes." This site will increase geographical awareness. It is at an upper elementary reading level, also the dolls are amazing! My Wonderful World "Geography is more than places on a map. It's global connections and incredible creatures. It's people and cultures, economics and politics. And it's essential to understanding our interconnected world." Thanks, Tessia. National Geographic Kids "Features different people, animals, and places each month with facts, games, activities, and related links." Well, hey, it's National Geographic. Very educational, and the games are fun, too. National Geographic Map Machine Zoom in on locations worldwide. National Geographic Xpeditions Atlas Maps made for printing and copying. Native Words Native Warriors. The story of the Code Talkers in World Wars One and Two, from the Smithsonian Institution's National Museum of the American Indian. Well done site tells the story of these good, brave men, as told by the Code Talkers themselves. Plenty of photos and explanations. Netstate "Learn About the 50 States! Armadillos to Yellowhammers!" (What about Zap, North Dakota?) Kinda like 50States but different. Besides having a Visit the States window listing all 50 states, this site has a menu of categories on the left side of the main screen that offers tons of information about each state. Oglala Lakota College A tribally controlled institution serving the educational needs of the Lakota Oyate, focused on the Pine Ridge reservation. Use their History and Culture menu to access their excellent Oglala culture site, Lakota Archives, their large collection of Lakota language audio files, and much more. ORBIS The Stanford Geospatial Network Model of the Roman World. This is not your normal map! "ORBIS allows us to express Roman communication costs in terms of both time and expense. By simulating movement along the principal routes of the Roman road network, the main navigable rivers, and hundreds of sea routes in the Mediterranean, Black Sea and coastal Atlantic, this interactive model reconstructs the duration and financial cost of travel in antiquity." Short version: Travel the rivers, roads, and seas of the Empire! Find out how long it took and how much it cost. Lots of ways to get from point A to point X, depends on who you are and how much money and time you have. There's a menu bar along the top. Click Using ORBIS to watch a tutorial (it's good, we recommend it). Click the Adobe Acrobat Reader symbol at the the top right corner of the page to get the tutorial, lesson ideas, and explanations in .pdf form. Clever teachers could adapt this for any level from upper elementary up to college-level. It's that good. Different in purpose from the excellent Digital Map of the Roman Empire but both are quite detailed. Oregon Trail for Elementary Schools This is arguably the best Oregon Trail site. Plenty of information and links. Comprehensive overview of life on the Trail. William has a broken arm. You have died of desentery. Quizzes.cc - Online Quizzes, Tests, Trivia, Worksheets, and Free Games "... provides math quizzes for teachers and students. You can create a quiz and select the range of numbers you'd like to use. Students can grade the quiz online and generate new problems for more practice." Quizzes for all four elementary operations, plus times table quizzes and a nice metric conversion chart. There are also children's literature, science, and geography quizzes. Secondary students can practice metric conversions, some middle school science, and world geography. Thanks to John@Quizzes.cc for the email! Seterra - Learn Geography. "Seterra is a challenging educational geography program with 70 different exercises. Learn about states, provinces, countries, capitals, flags and cities in Africa, Europe, South America, North America, Asia and Australia, using outline map exercises!" Quick, what's the capital of Slovenia? Of Texas? Where is Uppland? Find Burkina Faso! Find West Virginia! Click on Malta! This is wonderful freeware that really works with kids ages 9 and up - we've used it! Great for high school and college geography, too. From the talented lady in Sweden who brought you Sebran! New and improved! Seterra can now be played online, and micro-countries are included! Used and loved by geography teachers, it's one of our faves! SquinchPix Image Resource - "An Archive of European Imagery" Utterly astounding. Many thousands of artifacts, sculptures, paintings, castles, churches, temples, dishes, jars, ancient helmets, Minoan buildings, Pompeii, etc etc etc. All labelled by date made/built and location. State and County Quick Facts from the US Census Bureau. Tons of facts about US states and their counties. Strange plants of Socotra Island "It is like being on a different planet... These pictures and information are excellent viewing and reading. Socotra Island: You have to see it to believe it. This island simply blows away any notion about what is considered 'normal' for a landscape on Earth." Lots of photos of these unearthly, yet strangely beautiful plants! Also photos of people, buildings, beaches, some rare birds, more. Good explanations for it all. Go find Socotra on a map, people! What Time Is It Around The World Right Now? 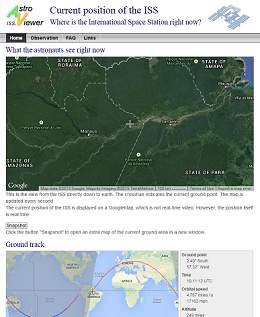 "This Flash Map of World Time displays current local time in any place around the world right now. World Time Clock & Map is an indispensable utility for everyone who deals with people abroad or anybody who is keen on knowing what time it is further than locally. This advanced Flash application is very helpful for travelers who need to know time difference around the world and want to be aware of world time zone they are traveling to, as well as for businesses which are located in different time zones and want to know current local time of their partners and customers." Also explains Coordinated Universal Time (UTC) and Greenwich Mean Time (GMT), Time Zones, Daylight Saving Time (DST), and Space Time. At the bottom of the page, there are links to Time Maps for Europe, Australia, The U.S., and Canada. World Atlas Huge site of geography facts, maps of everywhere! You should check it out. If it has to do with geography, it's in here! World Geography Games "Welcome! Can you point out Sudan on the map? How about the Strait of Hormuz? This website will bring you many entertaining and stimulating map games to improve your geographical knowledge. The quizzes include questions about countries, regions, bodies of water, mountains, deserts, metropolitan areas and other topics that will test and challenge your brain. For everyone who wants to explore and learn about the world, you've come to the right place!" Twenty-two very colorful, very accurate, interactive modules. These are all either "click on" _____ or "drag the correct label to" _____ exercises, perfect to learn geographic facts. Modules are forgiving and will help students learn. Available in English, Dutch, German, French, and Spanish. PS: There's a similar game of Europe only facts, too - Geography Games Europe. GSFK wants to thank Sonja Snoek and her company, EastDock Media in Amsterdam, Netherlands.